2016-06-01 - The League Rolls On! June 1st isn't Groundhog day, but it certainly felt like it. 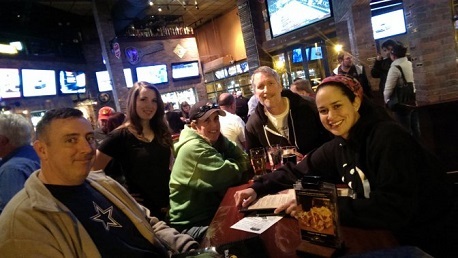 On another awesome night of trivia, the same two teams that battle for the top spot week after week flexed their mental muscles and, once again, finished a step ahead of the competition. Yes, this has been happening week after week, and game after game. And, to some (mainly other teams), it may be getting old. To me, it just illustrates the incredible rivalry and level of competition we have at the World of Beer Arlington. So, congratulations to I'm Turning PLC (I Really Think So) and The Mouseaholics on their first and second place finishes in both trivia games. Your trivia dominance does not go unappreciated. Lionheads, bubble eyes, and fantails are all types of "pleasure devices"
Now, for that bonus point opportunity. Find the US President that was the first to view the Pacific Ocean. Take the number of his presidency (Washington was #1, etc), then find the state that was admitted to the US at that number (Delaware was #1, etc). Now, simply tell me who is the Secretary of State for that state. Don't forget to follow us on Facebook and Twitter for hints and fun facts.